The posters heralding its arrival aptly proclaim, “Finally!” As a huge Eli Gerstner fan, those are my sentiments exactly!! After much anticipation and with great excitement—and being promised on Chol HaMoed Pesach 2007 that “it’s coming after the summer”–EG Productions newest release, Dovid Stein’s “Melech”, is finally here. It’s been a long wait, but so well worth it! 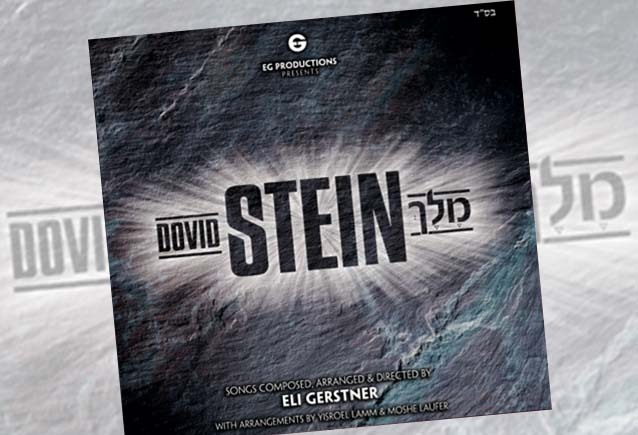 This album represents the marriage of two extraordinary talents: renowned producer and composer, Eli Gerstner, and rising star, Dovid Stein. Already recognized as a lead vocalist with Neginah Orchestra, Dovid now takes his musical gift to the next level in his debut album. This first track really sets the tone for the whole album as one you just want to keep listening to. Immediately one can hear that while the music is “classic” Eli Gerstner in that it’s innovative & exciting with lots of rhythm, there’s also a fresh twist here and a slightly different style. Dovid Stein’s voice—which is strong but also so easy to listen to—works so well with Eli’s creative musical arrangements. About halfway through the song, I started singing along with it. That’s sort of my test for the success of a song or album: is it catchy? Can I pick it up right away? The answer must be “yes” because I find myself singing this song several times during the day! It’s also a song that makes you feel like you want to get up and dance to it so this one is sure to become a staple at Simchos! When this song started off with the electric guitar intro, instantly I thought of “Keyl Mistater” from Chevra3 (interestingly the second track on that album, too) and wondered if this would be another funky song like that. But after that cool intro, the song goes in a different direction. You can really hear how powerful Dovid’s voice is; there’s a real energy there. It’s another fast song so the upbeat feeling from “Muvtach Lo” keeps rolling and it’s just as catchy as “Muvtach Lo”. I picked it up right away to sing along with it and it’s stuck in my head! This is the first slow song on the album and after hearing a couple lines from the intro, I knew that someone else—not Eli– composed this song. I guess I’m such a huge fan of Eli’s that I’d recognize his music anywhere and by the same token recognize when a song is not his composition. Sure enough I was right: This song was composed by legendary composer, Yossi Green, who joins Dovid to sing on this song. Having such a noted composer on this album, too, definitely lends another dimension. Even though it’s a slow song, there’s still a good beat here. The words, along with this tune, are an affecting and effective combination and the sweetness in Dovid’s voice comes through on this track. “Melech” is the title track of the album and it picks up right where “Muvtach Lo” and “Ki Bochar” left off. It’s got that same tone as “Muvtach Lo”: contemporary and original in keeping with Eli’s style! It’s fast and catchy with tons of beat and rhythm. I keep singing this one too. This album has already reeled me in and I’m not even half way through it. Dovid is thoroughly enjoyable to listen to. And, in a nice surprise the back-up choir includes members of Yeshiva Boys Choir!! It was a clever touch for what I suppose should be the standout track, being that it’s the title one, since Yeshiva Boys Choir is SO popular. This is another slow song. It’s really moving and stirring. Eli composed this song, though it’s a bit different than his typical slow songs. This sounds almost more like a Shwekey song, but that’s ok because I’m also a huge fan of his so it’s nice to have something of that style on here. I really hear the whole range of Dovid’s vocal abilities with this song as he goes from really low to really high at some points. This is a COOL song. It starts off sounding Middle Eastern or “Sefardi” and then gets really fast and upbeat and sounds just like something that would be played at spirited dancing during a wedding; it’s perfect for that first dance set when the Chosson and Kallah come in! It’s a total change of pace after the slower Vahaviosim but gets the listener back into the album’s excitement. About halfway through the song, the fiddles and what sounds like bongo drums come to the fore so that Middle Eastern flair is back. It blends perfectly with this high-speed tune. Eli composed and arranged this song and to me it represents a slight departure from what we are used to from him but at the same time illustrates the extent of his unique talents. The album switches gears again to another slow song—composed by Eli Gerstner & Yitzy Waldner– but it’s perfectly in place here after the electrifying Neerah. It starts off with a beautiful violin solo and then another treat for Eli Gerstner fans: Yaakov Mordechai Gerstner, Eli’s adorable brother and star YBC soloist, sings first and joins Dovid for this song. When they sing together, their voices blend nicely, particularly now that Yaakov Mordechai’s voice has changed a bit. It’s still distinctly Yaakov Mordechai but there’s a little more maturity and a little less “cute-ness”. L’tav Avid starts off slow…but even with the slow start, you can hear that something “big” is coming here and sure enough after the slow intro, it’s another upbeat fast song. There are a lot of “fast” tracks on this album but it just contributes to the pleasure and Simcha that one should experience when listening to it. Eli composed this song but it was arranged by another notable figure in the world of Jewish music, Moshe Laufer. I feel like I should have put on my dancing shoes before listening to this CD since these fast songs make me feel like I’m at a wedding and I just want to keep dancing. Dovid’s liveliness keeps coming through with each track and it just sounds like he’s having fun with the whole thing. When Dovid sings slow songs, it clearly comes from deep within his heart and soul. There is so much feeling and emotion behind it and this beautiful piece of music—composed by Eli Gerstner & arranged by Yisroel Lamm—is no exception. The words, “Sheemah Elokim Rinasi, Hakshiva T’filosi” are quite appropriate since the album was released right after the Yomim No’raim; this song gets you into a Chodesh Elul mode but can be inspiring the whole year through. Eli and Moshe Laufer collaborated again on this song, which seems to also, just like Neerah, have that Middle Eastern feel. Composed by Yosef Chaim Bloch. All the fast songs on this album transport my mind to a wedding with the different dance sets representing music from a variety of genres; this particular song has a perceptible Sefardi ambiance. Songs like this seem to be Dovid’s specialty, which is not surprising given that he sings at weddings all the time. I was at the YBC Live II! Concert when this song made its debut…and where Dovid Stein made his debut as the newest EG Productions star so I think it’s definitely fitting that it’s the bonus track on Dovid’s debut album… even though I like this song best when performed by Eli’s whole “cast”. But when the song started, the intro was different. It sounded nothing like the Lazer’s Niggun I was used to. This is a whole new rendition, which at first was a little disconcerting to a fan of the original song. But, after listening to it a couple of times, I liked it. There’s a lot of rhythm here, which seems to be in keeping with the general tone of the album and Dovid does an excellent job of pulling off this ensemble song by himself. It’s a perfect ending to a fantastic album. If you dont have some thing good to say, then dont say it. A review is meant to help people decide if they should spend their hard earned money on a CD. There are 100′s of cd’s, people can’t afford to buy each one. That’s why it’s important to know for sure if it’s gonna be worth the money. If a person buys a CD based on this posts review they will be let down, no CD to match this praise. There isn’t anything wrong with praising a good song or a good CD, but if everything is “THE BEST CD IN JEWISH MUSIC” then there are no bad cd’s and then how can anything be GREAT if it’s all “THE BEST”!!!! !